Japan’s Mitsui has become a co-owner of QIWI, Russia’s largest payment machine operator. The Japanese will help the Russians expand to promising Asian markets. Although most working Russians carry credit or debit cards, cash is still king as far as exchanging goods for money in Russia is concerned. There are a few reasons for this. While young Russians mostly feel comfortable using mobile banking services, far from most seniors are computer friendly, and they need to go to the bank to pay their bills. Plus, a number of large retailers, such as Auchan, accept only certain cards, making customers who don’t hold them pay cash. The Russian company QIWI manages a huge network of payment machines installed at many shopping malls, train stations and entertainment venues. These machines accept payments for mobile phone and Internet accounts, utilities, money transfers and other purposes an average person may need without going to the bank and waiting in line. At first, these terminals all but squeezed out mobile phone top-up scratch cards, and soon became a universal tool for electronic money circulation. 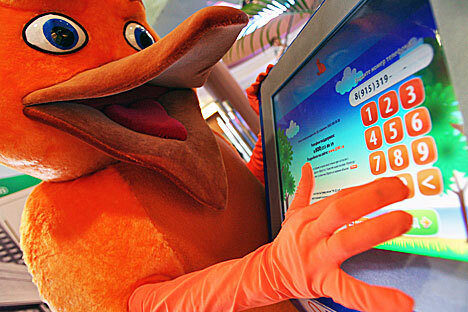 Around 80% of Russian mobile phone owners use payment machines. According to forecasts, payments through terminals should have reached around 750 billion roubles in 2010. QIWI, notably, controls up to 45% of this market. Japan’s Mitsui & Co. recently bought 14.9% of QIWI stock for an undisclosed amount. Analysts’ guesswork ranges anywhere between $4m and $80m for the stake. QIWI management has retained a controlling interest with 63.7% of equity, with another 21.4% held by Mail.ru Group. “In contemplating the transaction, we presumed that Mitsui’s assistance with our international expansion will open the broadest development prospects for us,” said QIWI Group President Andrei Romanenko. The company had long searched for a strategic investor that would help it tap into international markets. Vladimir Karpenko, a consultant with J’son & Partners Consulting, an international advisory firm specialising in telecom, media, and IT markets in Russia, the CIS, Central and Eastern Europe, believes that the Japanese will help QIWI install equipment for their terminals, conduct comprehensive research in individual markets, and negotiate with mobile phone operators. Apart from technical support, the deal with Mitsui will enable QIWI to use local and global brands for operations in various Asian countries. The Russian company is targeting primarily South-East Asia for expansion, and is particular intrigued by China and South Korea. The region is ripe for the payment machine business: Cash is popular, and competition is all but non-existent, with scratch cards still the main tool for topping off mobile phone accounts. Furthermore, the region’s mobile operators are more than generous with their agents. That said, QIWI’s actions are perceived as going beyond the mere desire for business expansion. According to Alexander Shirokovskikh-Smirnov, Chairman of the National Association of Electronic Payments Market Participants, the company chose to sell stock now because Russia is close to adopting a National Payment System framework, which could impose excessive market regulation and make the business unprofitable. “That’s why QIWI wants to pre-empt this and shift operations elsewhere,” said Shirokovskikh-Smirnov.